What is happening in the depths of the ocean? On the blue surface, it looks calm. But beneath, an underwater universe is bursting with sea turtles, colorful coral and massive mysterious creatures like whale sharks. At Azamara Club Cruises, we set out to sea on extraordinary journeys. We bring our guests to beautiful destinations around the world and across its oceans, so naturally, we care about the long-term health of the waters we sail and explore. We have been entrusted with this precious resource, so now, we must help protect it. Together, Royal Caribbean, Azamara’s parent company, and World Wildlife Fund (WWF) are working to protect this life beneath the ocean surface and ensure our world’s oceans remain healthy for years to come. THE OCEAN. MORE THAN MEETS THE EYE. 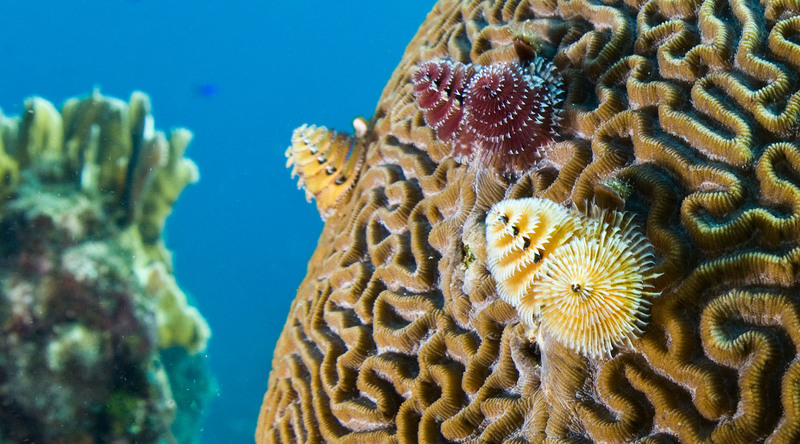 Oceans are more than stunning vistas, beautiful coastlines, and incredible marine wildlife. From the food we eat to the air we breathe, oceans sustain life. Oceans cover 71% of our planet’s surface, make up 95% of all the space available to life, and produce 70% of our oxygen. Oceans absorb heat and re-distribute it around the world, dominate the world's weather systems, and regulate global climate. Oceans are home to a vast array of incredible ocean species, such as sharks, turtles, whales and polar bears. From icy polar regions to warm tropical waters, oceans contain the greatest diversity of life on Earth. Oceans support people as a source of food, culture, and history. One billion people rely on fish as an important part of their diet and more than 520 million base their livelihoods on fishing and fishing-related activities for income and food. For 50 years, WWF has been protecting the future of nature. The world’s leading conservation organization, WWF works in 100 countries and is supported by 1.4 million members in the United States and close to 5 million globally. CREATURES AND PLACES TO LOVE. AND PROTECT. WWF works to protect key ocean species, work that influences and supports the survival of other species or offers the opportunity to conserve entire landscapes and marine areas. Polar bears depend on sea ice to hunt seals, rest and breed. But because of the ongoing loss of sea ice habitat from climate change, polar bears are now a threatened species. Sea turtles suffer from poaching, over-exploitation, habitat destruction and accidental capture in fishing gear, and climate change has also an impact on turtle nesting sites. Oil and gas development, entanglement in fishing gear, and collisions with ships threaten gray whales. WWF also works to conserve priority ecosystems such as the Coral Triangle in the western Pacific Ocean, the Galápagos off the coast of Ecuador, the Mesoamerican Reef region in the Caribbean Sea, and the Arctic Circle, which covers eight countries, including the United States. Our mission is to protect and conserve one of the world’s most precious resources—the ocean. We will strive to reduce the company’s environmental footprint, further ocean conservation, help ocean life thrive, and engage the global community to raise awareness about the importance of ocean and environmental conservation. Through our sustainability goals of reducing greenhouse gas emissions, sourcing sustainable seafood, and destination stewardship, we aim to keep the world’s oceans clean and safe for generations of future Azamara passengers. We all have a responsibility to protect the oceans. As you set out on your vacation, keep an eye out around the ship for WWF at Sea to learn more about the ocean, and how you can get involved as you cruise. Look for a special edition WWF magazine in your stateroom, WWF At Sea, full of engaging stories on WWF’s work on ocean conservation. On select sailings, join a WWF speaker to learn about their conservation work and how it connects to the destinations you are visiting. Ask to speak with the WWF Crew Ambassador onboard and learn more on how you can get involved. Delve deeper into the issues affecting the world’s oceans and ecosystems with on board presentations by guest lecturers from WWF. Get informed and take part in engaging discussions that will help you appreciate the destinations you visit on a more meaningful level and learn about how you can support WWF and their efforts on global oceans conservation. Nancy will be onboard Azamara Quest for the 10-Night Gondolas and Riviera Voyage, August 26 to September 5, 2018. Nancy leads WWF’s engagement with the ranching community in North America with a special focus on the Northern Great Plains region, where sustainable beef production goes hand-in-hand with conserving the iconic grassland ecosystem on which it relies. Through WWF’s Sustainable Ranching Initiative, Nancy is working to maintain grasslands for future generations by identifying and accelerating the use of more sustainable land management practices. She also works to influence national and global marketplace efforts on sustainable beef production. Nancy was born and raised on an 8,000-acre ranch in the Sandhills of Nebraska, owned by her family for 5 generations over 110 years. Prior to WWF, Nancy held numerous positions throughout the beef and bison supply chains and was appointed by the Governor of Colorado to the board of the Colorado Beef Council and US Meat Export Federation, a position she held for 6 years. Join along with WWF’s Nancy Labbe to learn how working farms like this Campania dairy can make a difference for our food and the planet. And of course, sample signature cheeses. Bryn will be aboard Azamara Journey for the 15-Night Journey to the North Cape Voyage, July 24 to August 2, 2018. Bryn Baker is Deputy Director of WWF’s Renewable Energy Program. Bryn works with WWF’s corporate partners to set ambitious renewable energy and climate goals to reduce emissions and create innovative approaches to scaling up renewable energy cost effectively. She facilitated the development of the Corporate Renewable Energy Buyers Principles that unifies the voice of large companies’ seeking more renewable energy to power their operations. Prior to joining WWF, Bryn worked for the US Agency for International Development (USAID) to launch the first regional climate and energy program in Southeast Asia. Ryan will be onboard Azamara Quest for the 18-Night Voyage of Discovery, October 13 to 19, 2018. Ryan leads WWF’s work in climate risk management. He currently manages the ADVANCE partnership with climate scientists at Columbia University, working to address climate change impacts, now and in the future, in WWF’s conservation programs around the world. Working in diverse landscapes in Latin America, Central and Southeast Asia, WWF is working with leading academics and other partners to build resilience to a warmer, more extreme weather world. Originally from Reno, Nevada, Ryan developed a deep appreciation for nature by backpacking, skiing, and hiking in the beautiful Sierra Nevada mountains and throughout the American West. Ryan received his MA from Duke in Environmental Management. Matt will be onboard Azamara Journey for the 10-Night Circle Cuba Voyage, November 10 to 20, 2018. Matt Erke is a Senior Program Officer with the forest team at WWF where he manages forest and wildlife conservation projects, as well as community-based conservation programs. Matt supports a high-profile tiger conservation initiative in Nepal that is serving as a model for successful anti-poaching interventions across Asia and is part of a global effort to double the number of tigers in the wild. Matt has an MA in Environmental Policy from George Washington University. Martha will be onboard Azamara Pursuit for the 11-Night Colombia, Panama & Peru Voyage, November 26 to December 1, 2018. Martha Kauffman is Managing Director for WWF’s Northern Great Plains Program, an ecologically rich region which spans the Northwest US and Canada. As leader of this program for the last 8 years, Martha has engaged leaders from across the region including tribal communities, ranchers, public land and wildlife managers, and other conservation organizations to conserve these important grasslands and restore abundant wildlife. A hydrologist and earth scientist by training, Martha has been focusing on solving complex environmental problems throughout her career. She is the current chair of the Northern Plains Conservation Network, and a member of the board of directors for the Montana Conservation Corps. Martha earned a BS in Applied Earth Sciences from Stanford University and a MS in Earth Sciences from Montana State University. Amy will be onboard Azamara Journey for the 10-Night Cuba Intensive Voyage, December 11 to 18, 2018. Amy Smith has more than 20 years of experience in legal and responsible forestry and trade. In her current role as Manager with the forest team at WWF, Amy engages with US companies committed to responsibly sourcing wood, paper, and rubber products from important forest regions, including the Amazon, the Greater Mekong and the Russian Far East. Prior to working with WWF, Amy was Director of PATS, a non-profit organization that supports indigenous communities in the Peruvian Amazon to produce and market sustainably-harvested wooden handicrafts. Amy has a MA in International Affairs from Columbia University and a BA in Political Science from Boston College. Aaron will be onboard Azamara Quest for the 10-Night Thailand & Vietnam Voyage, November 26 to December 6, 2018. Aaron McNevin directs the aquaculture program at WWF. Aaron has lived and worked in Indonesia, Thailand, and Madagascar and currently conducts various projects throughout the developing world assisting producers to become compliant with Aquaculture Stewardship Council (ASC) certification. His expertise has brought people together to understand the science of the negative impacts of aquaculture and generate performance targets that measurably reduce these impacts. Aaron received his MS and PhD from Auburn University in Water and Aquatic Soil Chemistry where he conducted coastal habitat impact assessments of shrimp farming in northeast Madagascar. Our mission at Azamara is to protect and conserve one of the world’s most precious resources—the ocean. We will strive to reduce our company’s environmental footprint, further ocean conservation, help ocean life thrive, and engage the global community to raise awareness about the importance of ocean and environmental conservation. Through our sustainability goals of reducing greenhouse gas emissions, sourcing sustainable seafood, and destination stewardship, we aim to keep the world’s oceans clean and safe for generations of future Azamara passengers.